Cindy was from the second litter I ever bred. She was sold as a 12 week old puppy to Nancy Hansen, whose main interest was obedience. Cindy had a UD and several OTCh points when she ventured into the breed conformation ring. 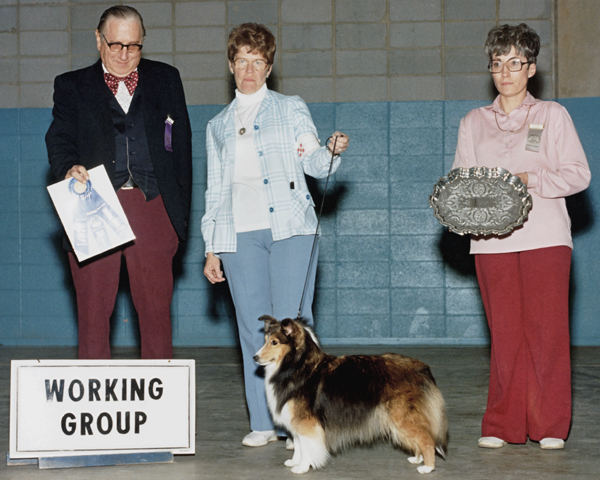 She astounded everyone by taking a Working Group I, owner-handled, at the Colorado KC show on February 25, 1979. This was back in the dark ages before the herding breeds were separated out from the working group. Cindy had at least one obedience High In Trial and several more points when Nancy unfortunately died. She had one or two litters for Nancy, and is behind the 1990s Ch. Mirthaven English Ivy and her daughter Ch. Mirthaven Rose To The Occassion. She also carries down to the Himark Obedience Trial Champions, OTCH Himark Lord of the Rings and OTCH Himark Ebony N Ivory.